Harrisburg, PA – Governor Wolf today toured the Rutter’s Farm Store in York and participated in a roundtable discussion with employees focused on how consumer-based initiatives like wine and beer modernization has helped the company grow and create jobs. 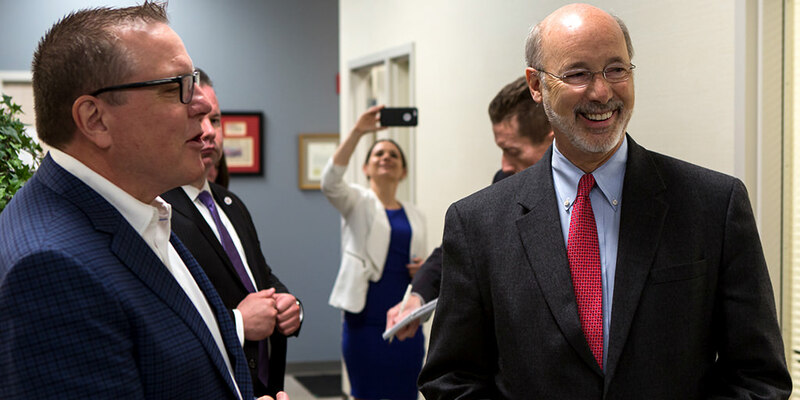 “We are proud to host Governor Wolf in our offices. With roots in Pennsylvania that date back to 1747, we have a rich history of evolving our business and meeting our customers’ needs to remain relevant,” said Scott Hartman, CEO and president of Rutter’s. “It is wonderful to see the Governor connect with us on that vision and share those similar values. His work on behalf of the people of Pennsylvania has been meaningful to our growth efforts, and we are grateful he was willing to come meet with our team members and engage in a productive dialogue. Since Governor Wolf signed Act 39 of 2016, Rutter’s has expanded to beer sales in eight stores, and wine sales in at least three stores, including the York location. “Rutter’s is a great example of the many Pennsylvania companies that are taking advantage of the Act 39 changes to grow their businesses and provide additional convenience and service for their customers,” said PLCB Chairman Tim Holden. “Not only has Rutter’s acquired wine-to-go permits, but they’ve also won a license from one of our recent auctions, and they’ve pursued conversion of a beer-only license to a license allowing them to eventually add wine to their shelves – all options that weren’t available until Act 39 opened the door to new opportunities for Pennsylvania businesses and consumers. Governor Wolf, since taking office, has visited approximately 70 businesses, talking with company owners and workers about what the commonwealth can do to help them thrive. In this year’s budget, the governor remains committed to continuing to grow our economy and create jobs by investing in 21st century manufacturing, workforce development and training programs, while also implementing new safeguards to ensure taxpayer dollars for economic development projects are spent appropriately and intended outcomes are met. Over the last two years, the Wolf Administration has secured over $2 billion in private sector investments in the commonwealth and commitments for the creation and retention of over 200,000 full-time jobs. The governor has also worked to increase the number of residents with college degrees and high-value industry-recognized credentials, and to expand economic opportunities for residents and businesses while fighting for a minimum wage increase.